2. 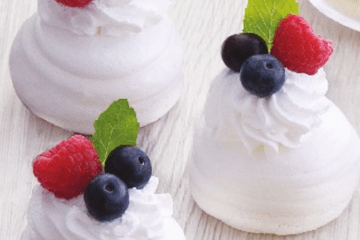 Mix BAKELS PAVLOVA MIX with water in mixing bowl and whisk for 15 seconds at slow speed. 3. Scrap down the mixture and whisk another 2 minutes at high speed. 4. Add in sugar and whisk for 1 minute at slow speed, then further whisk for extra 1 minute at high speed. 5. Pipe 20gm batter (or as desire) on baking tray layered with baking sheet. 6. Bake at 70°C±5°C for 10 minutes (depending weigh of batter). 7. Off the temperature and retained product in oven for 55 minutes.